I’m feeling super proud of myself at the moment. For the second time this week I got myself out of the house by 7:45am in the dark and freezing cold to my pilates class. From when I got up at 6:45am until I left it was an on-going mental battle for me. One little voice was telling me to just stay home in my warm house and the other little voice was trying to motivate me out of the house. Luckily the latter won. Today I have a secret family recipe to share with you. I had wanted to post it before the holidays but didn’t manage. So I’ll sell them as the perfect Valentine’s Day cookie instead of Christmas cookie. 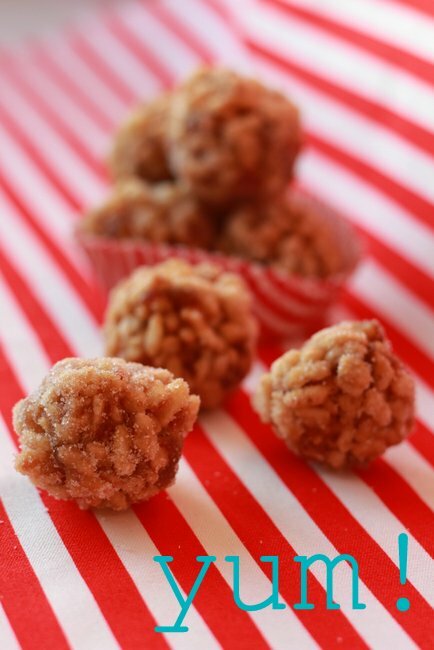 These little balls made with only 4 ingredients are one of my favourite treats from childhood. 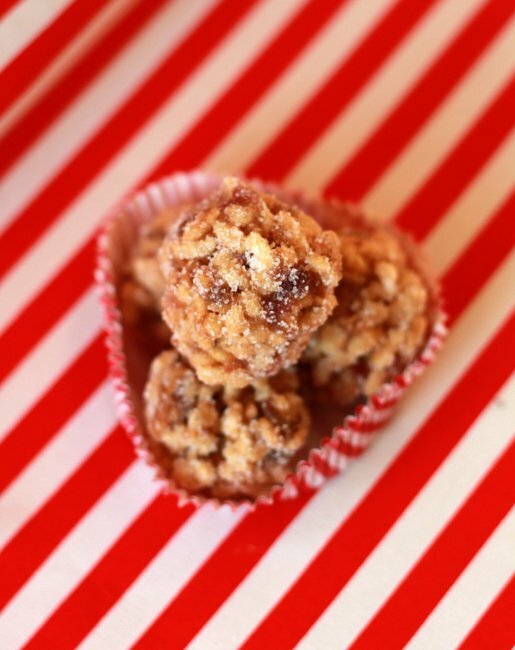 My grandmother used to make these for my brother and I and we would be able to scoff down more than a few. I was 23 when my grandmother actually told me the ingredient list because she knows that I would’ve been horrified if I knew there were dates in them. I was tricked for 23 years of my life. Usually I’m not a huge fan of cookies that involve breakfast cereal but in this case the rice crispies add crunch that compliments the chewy dates. I know they sound weird and slightly kitschy but trust me on this one…they’re incredibly tasty. 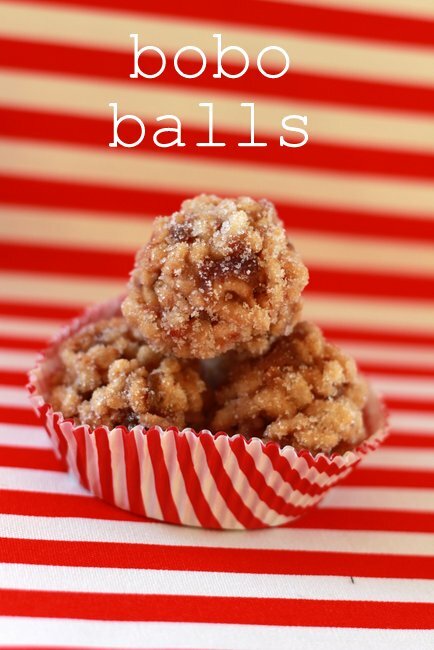 And as a bonus they are no-bake which means it takes minutes to whip up a batch of these. 1. Melt butter in pot, add brown sugar and dates. 2. Bring to a boil, lower heat, stir and cook until smooth (8-10 min). 4. With buttered hands form into uniform sized balls (approx. 2-bite sized). Roll in white sugar. 5. Store in air-tight container to keep crispy. Enjoy! I hope someone out there gives these cookies a chance and tries them out. And if you do, please let me know what you think. I have three kids who all love them (one being Miss Fussy) and I have followed my grandmother’s tradition of not letting them in on the secret of the dates in them. Color me impressed! It takes a lot to get up that early, especially on cold winter mornings. Bravo! ps. I love the cute styling too. Very Valentiney! Just DON’T tell him there are dates in them. Until he’s 23 at least. It’s an essential part of the recipe. I feared you would say dates. Hmm. They look tasty enough that I may have to give them a go. Good for her for not telling you! Hey….here in Italy it’s all about the outfit when you do sports.so if you have that ready you’re more than halfway there! Hope everything settles down for you soon…I know it always take a while to get life back in order after moving. Honey from Romania sounds delicious!